I've been working on something a little different recently: I built a bed! 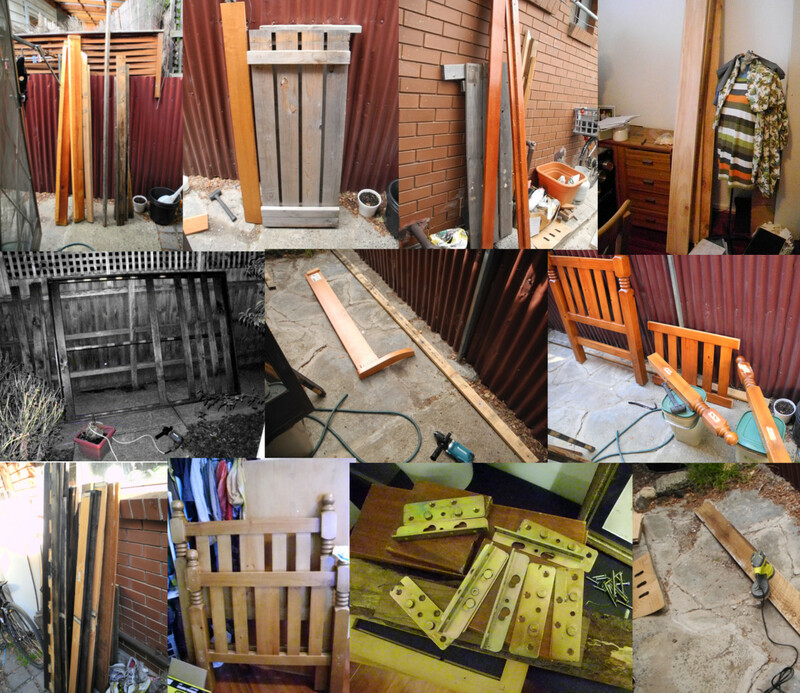 It started with collecting wood from the hard rubbish collection, most of which turned out to be discarded pieces of other beds. Originally I was excited about building things with shipping pallets and thought I would try to build a Pallet Bed, but when I found so much good timber being thrown away, it became the Bed Bed Project: a bed made of beds. Collecting wood was an adventure in Brunswick, where, as Catherine Deveny says in the forward to Stamping Ground: Stories of the Northern Suburbs of Melbourne, "that's why I love this place, a suburb where old Aussies, young Lebanese families, student households, Italian nonnas, Greek yayas, Somalian youths, Indian cab drivers and latte-frothing lefties like me live side by side and covet each other's rubbish." Yes we do. It's more like a community garage sale than removal of waste, a place to meet your neighbours and discuss the usefulness of that chair, or what treasures you're looking for in this year's collection. So I collected myself the parts of six former beds and a bunch of timber with unknown previous lives. And then I recorded the origin of each piece, so my bed could be a map of Brunswick. (More on that later.) I called my dad, an experienced woodworker, and found plans to build a bed from my new "homemaker" hero, Ana White. (She calls herself a homemaker, but means that she and her family literally made their home.) The plans were subjected to continual alteration as I found new pieces of wood that almost, but not quite, fit the description of the material list of the plans. And then I got building. Making the bed out of pieces of other beds meant that many of the key structural pieces were already cut to size. But a few of them were being adapted from previous lives as other things, so I had to learn to saw as straight as possible using a hand saw. Years of experience with a jeweller's saw may have helped somehow, but it didn't translate into the ability to saw a perfectly straight line across a 4x4" block of wood! Trial and error with several scrap pieces determined that the best solution available to me was a mitre box with two pieces of scrap wood clamped to the top to get the cut started. Yes, I could have bought a power saw, but two things stopped me: 1) If I bought a table saw, I would need a table. And where would I put that table? and 2) There would be something magical about being able to build something from discarded materials with simple tools, in keeping with the ethos of the Urban Bush Carpenters. That looks straight to me! The next step was the tough one: hours and hours of sanding with a random orbital sander I bought for the purpose. I set out knowing this was going to be a tricky project, my only power tools being a drill and the the new sander, my workshop consisting of 1) a courtyard that I can stretch out my arms and touch both sides of and 2) a shared driveway - neither of which have anything approaching a level surface. Not having so much as an outdoor work table to cut the wood on (and not wanting to buy anything else that would clutter up my already crowded courtyard), I set up our two Bokashi bins as a base to saw on. After cutting the pieces to size and sanding off their old scratched up finishes, working my way from 40 to 240 grit, I was ready to assemble. I followed the advice of my library book Wood Finishing 101 and did the final 240 grit sanding step by hand, to avoid leaving excessive orbital marks with the electric sander. But here I reached a new challenge: as soon as the bed was assembled, I would have no place to store it, let alone work on it. I certainly wouldn't have the space to stain and varnish a fully assembled bed. More modifications to the plans were needed. So far I had kept all the bits and pieces that I had removed from the wood I'd collected. Several pieces of previous beds had brackets attached to the corners, and I now had a small collection of various mismatched brackets. Each bracket consisted of two parts: one that slots into the other to join a corner. Amazingly, I had managed to pick up four matching sets from two different beds, even though two of the male sides of the brackets came from one bed, and two female sides came from a different bed! Two pieces were bent, but that left me in the comfortable realm of metal, and I knew that a few hammer blows and a flat surface would sort that out. Good as new! Lucky I found enough matching brackets - new ones weren't available at the hardware store! Then there was the problem of the middle strut and its two middle legs, needed to support the slats across the bed. Another phone call to my dad in America to find the answer: joist brackets. Made to support framing wood in building construction, the joist bracket was an ugly but practical solution to fully dismantle-able bed - and it would be invisible in the finished product. Attaching the joist bracket to support the middle strut, with the top of the bed facing down (on my living room floor). Finally, something that looks like something! Next step: nailing and gluing on the trim. This went pretty much according to the plans, with more advice from Dad on how to set finish nails. Again I was in familiar territory: finish nails are hammered into the wood as far as possible, then set (pushed down beneath the surface of the wood) with a nail set (or a repousse tool, if that's what you have handy), filled with wood putty and sanded back to be invisible. Just couldn't resist getting out the jeweller's saw! My first nail went in at the wrong angle and threatened to pop out the side, so I just cut it off and set it anyway. Once the holes are filled with wood putty, the set finish nails are nearly invisible. The trim was the only part of the bed that I couldn't find in the hard rubbish, so in the end I bought the wood at a hardware store. I ended up buying 2x4"s of structural wood, which is used for building houses, rather than premium pine. The premium pine has a much nicer finish, but wasn't available in a 2x4". One thing I learned quickly when collecting wood was that there are two main categories of recycled wood: outdoor wood and indoor wood. You know those pieces of fencing that someone's throwing away that are perfectly flat and the right size, and look like if you just sanded them back they'd be pristine underneath the weathered finish? They're not. The weathered, split, splintery wood goes all the way through. Also, in Australia a large percentage of outdoor wood is treated pine. Although treated pine has been phased out in the US and parts of Europe, it's still widely used here, and is treated with arsenic to increase its outdoor longevity. There's a lot of controversy about whether the levels of arsenic that leach from the wood are safe or not, but it's certainly not good to be breathing in or exposing your skin to while sanding, and it was never intended for indoor use. So stay away from the outdoor wood, if you're building indoor furniture. Besides, the "indoor wood" I collected had a much smoother finish, even considering having to sand off the previous stain and the scratches, than the structural wood I bought for the trim. The purchased wood ended up being the worst quality wood of the whole lot! Suddenly it was coming together quickly. The bed was assembled. Excess glue was sanded back. Imperfections were filled with wood putty and sanded back, and bolt holes from their original lives were filled with dowels and sanded. One piece that I found was a headboard and end-board from a single bed that was left in the hard rubbish with a plastic bag full of the corresponding bolts and wood buttons to cover the holes! When I saw that, I couldn't take it at first, knowing that I would cut it to pieces but someone else might be able to use the whole thing. I knew that street's rubbish would be picked up early in the morning, though, so I went home and came back at night, and it was still there. No one else was going to take it now, and at least I would make use of it! There weren't quite enough buttons to cover the holes, so I sawed some of them in half to create two. All that was left was to stain and varnish! I used 2 coats of Cabot's water-based Stain & Varnish in Sutherland Teak colour, applied with a varnish brush using the dry brush wiping method described in my trusty library book, Wood Finishing 101. I couldn't believe my luck when I found a dilapidated bed frame with all the slats intact near enough to my house to walk it home! A woman working for the old folks' home nearby saw me carrying a bed frame home during hard rubbish collection week and got up from her break to insist on helping me carry it! That's Brunswick during hard rubbish collection. The slats were 1/4" too long, so I cut them all down to size and attached them to three straps of scrap corduroy. This way the slats stay evenly distributed, and easier to manage when the bed comes apart, the next time we move house. I thought maybe I could just staple the corduroy straps on, but that proved impossible, and I ended up hammering brads into the wood. All done! Now to take it all apart and move it into place. Drumroll please... the finished bed! Old bed out of the way, dust bunnies swept up, new bed assembled and in place! And that, my friends, is how you build a bed out of rubbish, in a courtyard the size of a balcony, with no woodworking experience to speak of. If I can do it, so can you! What are you building? I've already collected wood for my next project, the headboard. Stay tuned for the story of the Brunswick Patchwork Headboard Project, and the bed map! Wow Mel! What a fabulous achievement - it’s beautiful. You must be feeling great satisfaction from this accomplishment. The bed linen compliments your design. Modern Danish? looking forward to seeing your headboard. Thanks, Sylvia! It was fun to try something different, and working with reclaimed wood I didn't have to worry about ruining expensive materials by making a mistake while I was learning. And now I have a comfy new bed! I totally love it!!! The craft of it all finding all the right parts, YOU GO GIRL!!!! Maybe my plan to build a floor to ceiling indoor storage unit for my tiny kitchen is do-able after all...it's just shelves really isn't it?! It's just shelves! You can totally do it, Nicky!